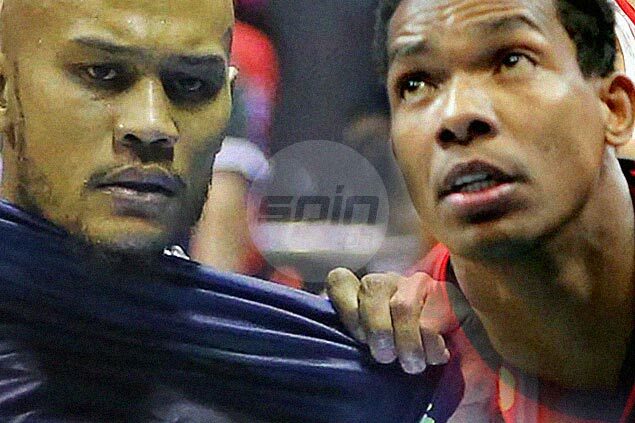 Kelly Nabong and Gabby Espinas hav switched sides after yet another PBA trade. SAN Miguel Beer continued to strengthen its frontline after acquiring eccentric Kelly Nabong in a suprise trade with Globalport on Thursday. The Beermen gave up Gabby Espinas and its second-round pick in the 2020 rookie draft to acquire the Fil-Am power forward, who played his final game for the Batang Pier on Wednesday night in a 135-108 rout at the hands of Phoenix in the PBA Commissioner's Cup. Nabong is expected to boost the Beermen's bruising frontline now made up of four-time MVP June Mar Fajardo, veteran Arwind Santos, rookie Christian Standhardinger, and import Renaldo Balkman as they try to make the quarterfinals of the mid-season tournament following a slow start. The trade was the second in three days for the Batang Pier, who earlier dealt rookie Julian Sargent to Barangay Ginebra for Paolo Taha. Curioulsy, Nabong struggled in his last outing for Globalport, going 0-for-4 from the field and finished with just a single point before fouling out after playing for 21 minutes opposite the Fuel Masters. He did finish with five rebounds and five assists, though. The trade ended a seven-month stay at GlobalPort for Nabong, who was let go by Meralco last year after a bench dispute with then Bolts assistant coach Jimmy Alapag. San Miguel immediately welcomed the addition of the 29-year-old Nabong to its fold. "I think both parties will benefit from it (trade) considering the short term and long term objectives of both parties," said San Miguel team manager Gee Abanilla. "On behalf of SMC, we warmly welcome Mr. Kelly Nabong to our fold," he added. "We also want to thank Mr. Gabby Espinas for his valuable services during his tenure with the Beermen." It will be a homecoming of sort for the 36-year-old Espinas at Globalport, where he briefly played for a month before being dealt to San Miguel as part of a complex four-team, six-playe trade.